We are an ISO 9001:2008 accredited firm, engaged in manufacturing, supplying and exporting a range of Self Adhesive and Packaging Tapes. These are widely applauded for their excellent finishing, smooth texture and high adhesiveness. 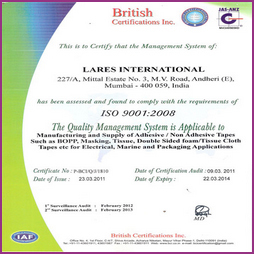 Established in the year 1991, we, 'Lares International', are an ISO 9001:2008 certified manufacturer, supplier and exporter of a quality approved range of Self Adhesive and Packaging Tapes. The range offered by us encompasses Duct Tapes, Gaffer Tapes, Artist Tapes, Masking Tapes, Spike Tapes and Antislip Grip Tapes. Along with these, customers can avail from us an assortment of Checker Board Tapes, Packing Tapes, Reflective Tapes, Barricade Tapes, Tunnel Tapes, Glow Tapes and many more. All our products are made using finest quality raw material, adhesive coating and printing. We are assisted by a team of hardworking and competent professionals, which helps us in proper accomplishment of all the business related tasks. The professionals working with us are masters of their respective fields of specialization, which benefit us in completing even the tough tasks with perfection and on-time. All our professionals keep in constant touch with the clients'', so as to know their exact requirements and modify our range, accordingly. Further, skill enhancement sessions and workshops are arranged by us to keep our workforce updated with changing market dynamics. Since our commencement, we are committed towards providing excellent quality Self Adhesive and Packaging Tapes to the clients. For stringent checking of all the offered products, we have appointed a team of expert quality controllers. Our team members keep a strict vigil on all the stages, right from procurement of raw material to production till final dispatch of finished products. All our products are manufactured using qualitative raw material in adherence with international quality standards.